In a previous blog entry (you can read it here) I talked about how NLP has grown beyond a single field of study and likened it to the lineages found in martial arts. There are dozens, if not hundreds of companies offering NLP training in the UK, each one is different to the next, with different styles and bias’s. With that much choice, how do you know which one is right for you? Every NLP training company offers slightly different trainings and what suits you will come down to your personal preferences. With so many companies offering NLP trainings the good thing is you have a wealth of choice available to you, the bad thing is, to the newcomer to NLP, it can be a huge and confusing field and it is very difficult to find all the information to make the right decision about which training to book on. With so many different styles and types of training out there, it is ESSENTIAL that you do your research before booking on a course, rather than just booking on the first one you find on Google (of the people I meet who were unhappy with their NLP training, I hear the same thing again and again – they just booked on the first one they found, or the most convenient, or the cheapest and gave no thought to quality or style of the training). I am realistic and recognise that the course I run is not going to be for everyone, or maybe you live in a part of the world where it is just not possible to attend one of my trainings! It is important that you have an idea of what you want to achieve from your training. Having a purpose will help you get the most out of NLP and help you to find the right NLP course for you – one that will help you to get what you want. Do you want to use NLP predominantly in a business setting? Are you interested personal development? Do you want to start your own coaching or therapy practice (or already involved in coaching or therapy and want to add NLP to your skill base)? It’s useful to understand something about NLP in advance of looking for a trainer. Having a basic knowledge of the subject will make it easier to select the trainer that can deliver what you want to get out of NLP. Be careful, however, to avoid “making up your mind” about what NLP actually “is” just by reading a few books before you attend a training. It is much harder to undo a misconception and keep an open mind (which is essential during an NLP training) and you may miss out on valuable information because it does not match your preconceptions. Do you like the idea of watching DVD’s and listening to CD’s before you attend the course, or does the idea of having to do all that pre-work turn you off? Do you want to learn lots of prescriptive techniques or do you prefer a free-form training where you will be able to develop your own ideas, techniques and processes? Do you want to get the training done in “one hit” or do you think you will be better suited spreading (Maybe your diary doesn’t allow one of these options)? Do you want to attend a larger group training where you will be able to remain somewhat anonymous or you do you want a smaller training with lots of hands on support? There isn’t a fixed price for NLP training and you can find training courses that offer exactly the same qualification for wildly different prices. There is no correlation between the training fee and the quality of the course. Often the price of the course will be affected by things outside of the training – cost of the venue, how much the company spends on marketing, etc. You will often pay more for an experienced trainer, but that is not strictly the case. I have seen two very experienced and respected NLP trainers offer their practitioner training for £999, and I have seen unknown, inexperienced trainers charge in excess of £2000! In NLP, the most important part of the training is not the qualification, or the qualifying body, or the length, cost, location or date of the course. It is the trainer. Sadly, it is quite possible to do your Practitioner, Master Practitioner and Trainer qualification and set yourself up as an NLP trainer in as little as a few months, without every gaining any real practical NLP experience. So it is important to check the trainers experience and credentials to teach what they do. Don’t just believe the marketing blurb on their website. Although it is illegal to lie about what you have done, can do and offer, it is common for NLP trainers to embellish such things as a their experience and length of time they have been training. The obvious starting point for any search nowadays is the internet; you go to your favourite search engine and type in the criteria that you want. The problem with relying on the internet is that the training companies who appear at the top of the search engines aren’t necessarily the best trainers, they are just the ones that have spent the most money on marketing. Compare the trainer’s approaches and speak with them via telephone or email. Assure yourself that you are making the right decision and the best investment of your time and money. You can get you copy on Amazon for just £1/$1. UK here. US here. 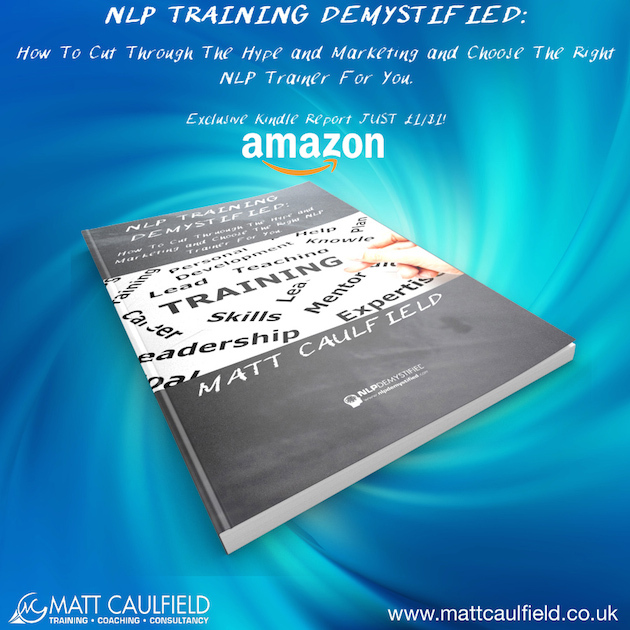 I once heard a well-respected and experienced trainer discussing how he could not find “authentic NLP” anywhere, he also once suggested that Bandler and Grinder didn’t really understand fully what they had stumbled upon when they discovered NLP. I think he is partially right on the second point, which makes the first complaint about the lack of authentic NLP somewhat of a red herring. Bandler and Grinder were just excited about what they had discovered and had this bunch of stuff, they then retroactively named and tried to define what they had found. Because of this NLP has always lacked a succinct definition and pretty much every NLPer will define NLP in a different way. Robert Dilts considers that we are now in the “3rd generation” of NLP where the “model” has gone beyond a small controlling group and has now spread far and wide, it is used in pretty much all aspects of modern life, from therapy to sales to teaching to sports to personal development…the list goes on. With NLP spreading way beyond the original small group of creators, I now think it is time to look at the idea of “authentic” NLP in a different way. There is no longer just “one type” of NLP. The problem with this is that is as meant the NLP scene can appear a chaotic and terrible muddle. Having sat back and observed the ructions, spats, disagreements and outright hostility between different NLPers (and having, foolishly, gotten involved on several occasions and been unfairly mean about certain trainers – for those that I have been mean about I offer a full and public apology right here, it was wrong of me, I was naïve and full of self importance…), I have always found it hard to explain or justify to people new to NLP how all this bickering and aggression has filled a field that holds communication, flexibility and “relativism” as some of it’s basic tenants. More than once I have come across someone who said they were interested in NLP, but put off by the aggression shown by one NLPer to another. So, here I offer a perspective that may help heal some wounds in the NLP world for the good of everyone! In this post, I put forward the idea that NLP wasn’t a science, nor does it need to be. I discussed how it is advantageous to consider NLP as a craft, or better still, a discipline and likened it to a martial art. We can expand this analogy of NLP as a martial art to discuss the concept of “authentic” NLP. If you have studied martial arts, you will probably recognise this idea, if you haven’t I will do my best to explain it. Of course, you will probably think of lots of different analogies, maybe some that you understand more (or even fit better with the idea I putting across), I am picking martial arts for 2 reasons; 1) it fits with my original discussion and 2) I know quite a bit about martial arts! The idea of lineage is important in many different martial art styles; karate, kung fu, tai chi, even boxing has a lineage of sorts. For the sake of this example, I am going to use Tai Chi, just because it is the martial art that I know the most about (at this time). In Tai Chi, you have several different styles or lineages. The lineages often come from a break away from an earlier lineage. So for example you have the Wu style, the Chen style, the Yang style, etc. Each one is different from the next, but all have shared core methodologies with each other and can be traced back to the “source”. It is important to stress at this point, no lineage is fundamentally “better” or “worse” than another. They are different, and which one you may choose to study depends on your personal preferences and interests and outcomes. People may try one or more styles until they settle on the one they feel most comfortable with. We can use the same idea to look at the current major qualifying bodies in NLP and consider them as different lineages of the same art. They are different, and have different styles, ways of doing things, and place more importance on certain things. But one lineage is not better (or worse) than any other, just different, and each lineage suits different people (most probably the reason the splits occurred in the first place?). If different lineages can exist side by side in different martial arts (with, admittedly, a little bickering from time to time), then surely the different lineages in NLP can co-exist? NLP celebrates difference. It is the “study of subjective experience” after all. It should recognise that one style or lineage is no better (or worse) than another, just different and suits different people. I make the attempt here on my website, and on my trainings, to make it clear what “lineage” of NLP I do and who would suit it, I am endeavouring to be as transparent as possible so that people choose the “best fit” for themselves. I have heard complaints about certain NLP companies, and often these complaints come down the trainee picking a “lineage” they weren’t comfortable with. Easily done with the current state of NLP. what are the major lineages in nlp? Let’s look at the major “lineages” of NLP (that I have discovered). I have split these into each major qualifying body. These are listed in no particular order. training style: Minimum of 120 hours of training – Most commonly 7 days face-to-face training combined with pre-course audio study. training style: Minimum of 130 hours of training – Most commonly 7 days face-to-face training combined with pre-course audio study. training style: Minimum 130 hours tuition over a period of 15 to 18 days (used to be 21 days) formal face-to-face training. training style: Can be 8 days face-to-face training combined with DVD home study. Usually 13-14 Days face-to-face training. If you have trained with any of these different “lineages” and would like to discuss more details about each one, or if you think I have missed a “lineage” out, please leave a comment below. https://mattcaulfield.co.uk/wp-content/uploads/2018/07/Enfold-Header-logo.png 0 0 Matt Caulfield https://mattcaulfield.co.uk/wp-content/uploads/2018/07/Enfold-Header-logo.png Matt Caulfield2010-08-11 11:38:502014-04-15 09:36:17authentic nlp?